It’s uncommon to see people flop down on the carpet in an upscale hotel lobby. 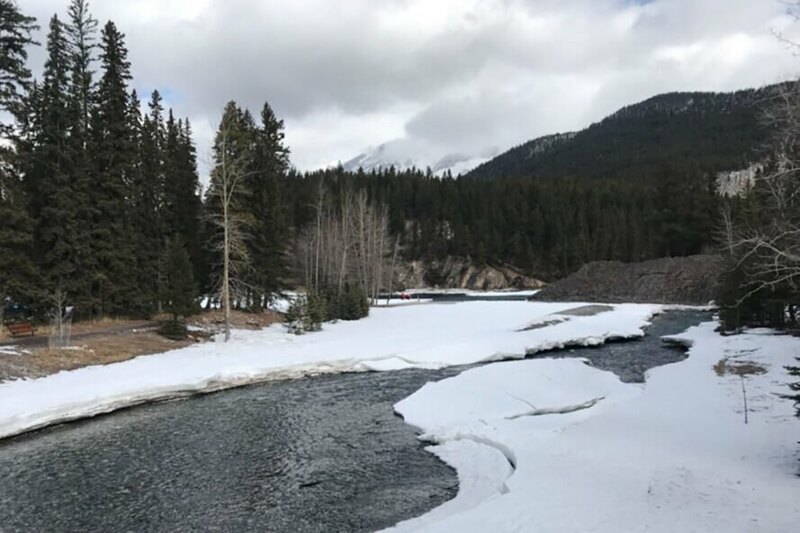 But at the Fairmont Banff Springs on a Friday morning, a middle-aged woman from Indianapolis and two kids from Montreal are the latest of many to reject decorum when faced with Bear’s charms. The black lab gazes at them with liquid amber eyes while rolling over for a belly rub. It’s all in a day’s work for Bear, a canine ambassador who give travelers a dose of human-animal connection. 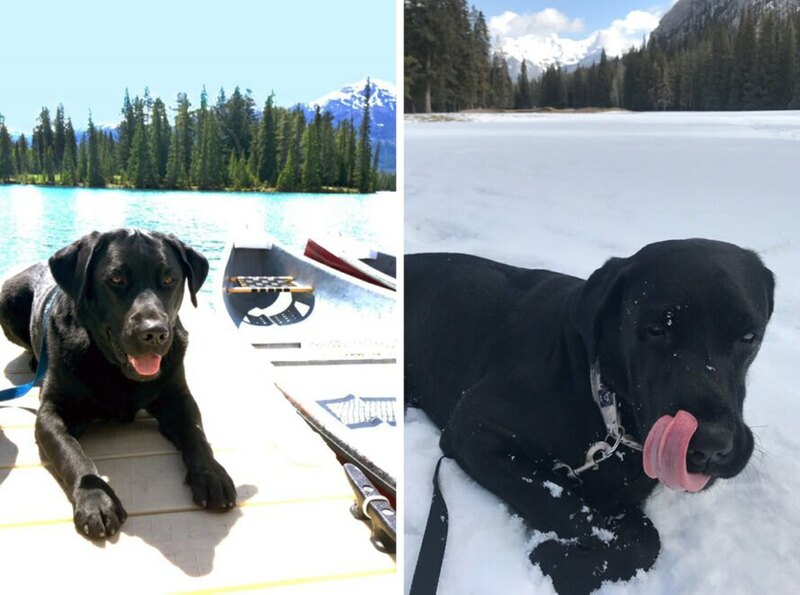 The Fairmont’s canine ambassador program is spreading around the world, from Georgie, a yellow lab in Washington, DC to Tusker and Grammy, ridgeback/lab sisters at the Fairmont Mount Kenya Safari Club. About 16 dogs now work for the hotel chain. Some people might find it gimmicky, but travelers missing their pets are drawn to the dogs like magnets. In Banff, the floor of the VIP concierge area, Bear’s lair, is littered with toys brought by admirers. Why do people like dogs so much that they lavish gifts upon a hotel’s canine ambassador while on vacation? Humans have probably hung out with dogs for somewhere between fourteen and forty thousand years, depending on which researcher you ask. Some scientists credit dogs with helping humans survive. It’s true they’ve guarded our lives and property, herded sheep, pulled sleds, shared warmth, helped hunt and even, in a pinch, provided babysitting services. Most pets don’t earn their keep in such tangible ways. But humans do expect emotional connection and interaction. Many humans prefer dogs to cats because Fido is more likely than Fluffy to enthusiastically greet them at the door. A recent study by Japanese animal behaviorist Takefumi Kikusui found that when humans and their dogs gazed into each other’s eyes for several minutes, oxytocin levels rose in both species. While it increased by up to 130 % in the dogs, the humans experienced up to a 300% percent boost of this emotionally bonding hormone. No wonder people feel like something’s missing if they don’t bring their dog on vacation. Of course, it takes a special kind of dog to be willing and able to provide so much love and support for throngs of strangers. Many of the Fairmont dogs are dropouts from the Canadian Guide Dogs for the Blind program. They don’t make the final cut because of their personality or a health issue. Dropouts are usually too friendly and sociable to be seeing eye dogs. 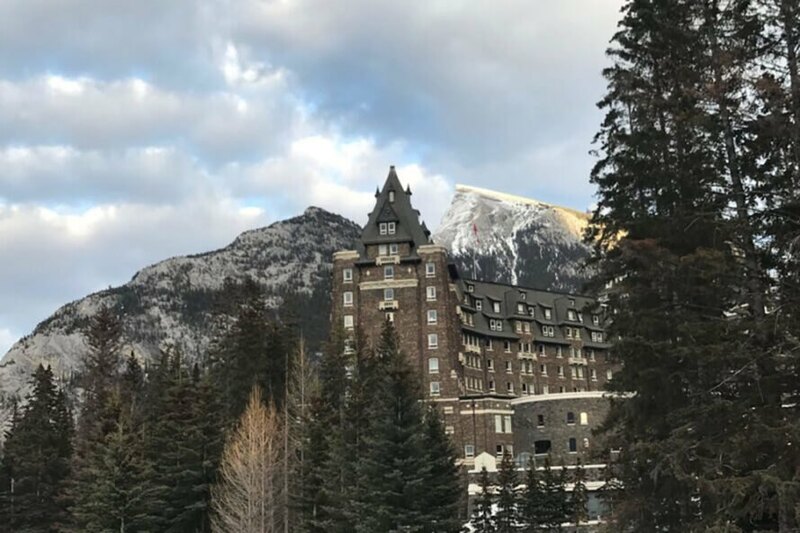 Laurent Pelletier, assistant director of food and beverage at the Fairmont Banff Springs, was considering adopting a family dog at the same time the hotel wanted to acquire a canine ambassador. “In a meeting, somebody asked would anyone be interested in being the dad,” Pelletier said. He and a few others staff members put their names in. Pelletier won, partly because he had dog-friendly attributes like a backyard and two children. When the day came, Canadian Guide Dogs put Bear on a plane from Ottawa. The whole family went to meet Bear at the airport. The lab/retriever mix spent a couple of weeks adjusting to his new home before he started his job. “He was extremely well behaved. But now he’s not as good,” Pelletier says affectionately while Bear mouths his hand. Bear started his job part time in fall of 2017. After about a month of staff walks, Bear was comfortable enough to start walking the guests. Now Bear works fulltime from 8 a.m. to 5 p.m., just like Pelletier. “It’s almost like he’s a human,” Pelletier says. “Some days he doesn’t want to get out of bed. I’m like ‘Bear, we’ve got to go.’” Bear spends most of his workday receiving visitors in the VIP concierge lounge. In winter, he might get a couple of guest walks per day. In the summer high season, they limit guest access to Bear. “There were days he barely got a break,” Pelletier says. Lewis manages Bear’s calendar, which includes walks with guests and occasional promotional appearances. Bear has a following of devoted fans and repeat visitors. “As soon as they book their room, they book a walk with Bear,” says Pelletier. Not only does Bear provide doggy affection, some people feel safer going on a trail with a dog. Sometimes Bear gets overwhelmed by guest attention. “You can see him tell you, ‘I’m over it,’” Lewis says. Bear slinks off behind the concierge counter when he needs a break, or holes up in Pelletier’s private office. Despite Bear’s extensive education and training, he’s still a normal dog. When he gets off work at five, he’ll play with his friend in the neighborhood, another black lab, or with Pelletier’s kids. “He’s a lot rougher with our kids than with the guest kids,” Pelletier says. “When he’s here, he’s at work. At home, he’s at home.” But even with the guests, Bear isn’t quite 100 percent domesticated. There’s still enough wildness in him to growl at a squirrel or dive into a snowbank. 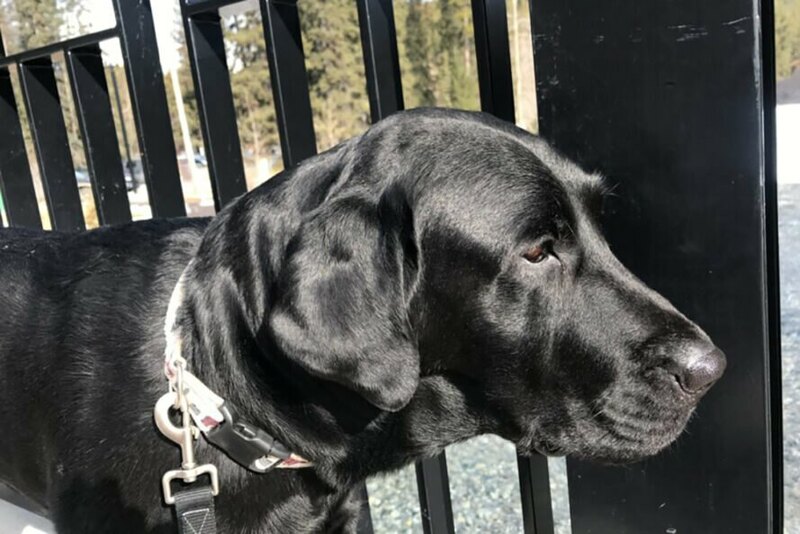 The Fairmont Banff Springs offers a canine ambassador program to improve human-animal connection. About 16 dogs work for the hotel chain. Recent studies suggest that interaction between dogs and humans promote a rise in oxytocin levels. The majority of the dogs at the Fairmont hotel were once enrolled at the Canadian Guide Dogs for the Blind program. For travelers who miss their dogs while on vacation, the canine ambassadors program is perfect.